Last week I had the pleasure of teaming up with ASOS to coordinate my first SXSW Style Diary. Naturally I fell for a white frock (duh! ), with a shift shape (flattering, as always), a classic silhouette, and a timeless style. This V Neck Shift Dress by ASOS also just so happens to be on sale (yessss! ), and also transitioned effortlessly from festival season to spring season. I styled it with booties and a leather bomber here for SXSW, but I also wanted to fashion it on today’s post for endless, darling spring-wear — to show all of the versatile opportunities possible. This darling v neck frock also happens to be my Easter Dress (it’s comin’ up!) and a go-to for a effortless everyday wear. 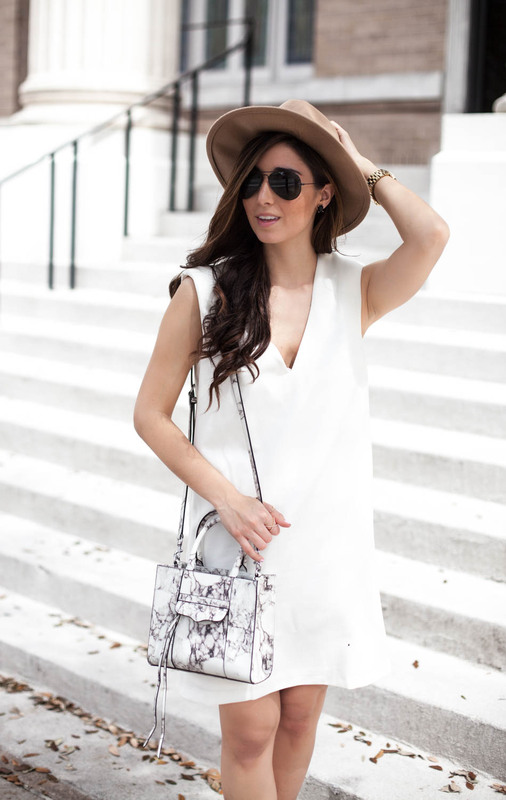 When it comes to accessorizing a plain yet fashionable shift dress, it’s all in the details. I pulled out this darling Medium MAB Marble Tote by Rebecca Minkoff to give the outfit an extra touch of texture. Adding in a pair of (note: very comfy) wedges is key to dressing for comfort and style this season — so the Damita wedges by Michael Kors were a no-brainer (especially because they are on sale too!). A felt fedora is a fun way to dress up your favorite casual #ootd, along with adding in a touch of Kate Spade jewels (on sale as well!). Effortless, minimal, classic, and chic. Stay fashionable and comfortable, darling + scroll down for more deets and links! Happy Monday! As always, this look is stunning. I love how you accessorized the dress – and those Michael Kors wedges are so darling. I must get a pair! 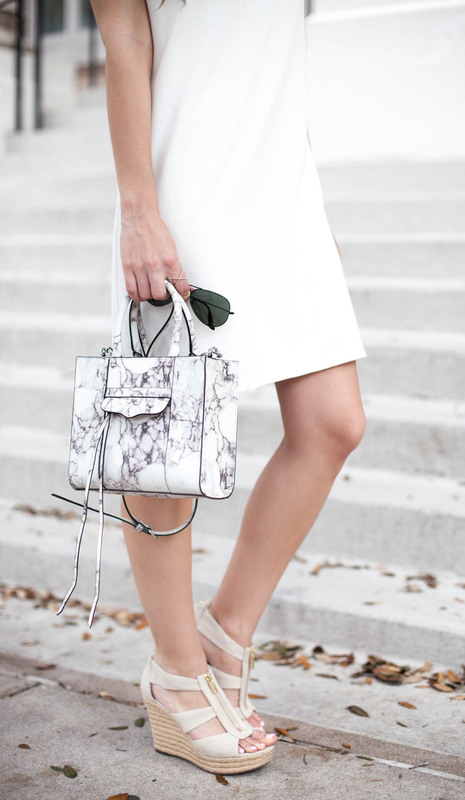 the white dress is pretty perfect, but I cant get past that marble bag!!!!!!! stunning!! I love the white paired with the tan hat! Great combo 🙂 Also this bag is fantastic! So obsessed with that RM bag, and I love the way you styled it. Gorgeous as always. Totally agree, this dress looks like a must have for spring! 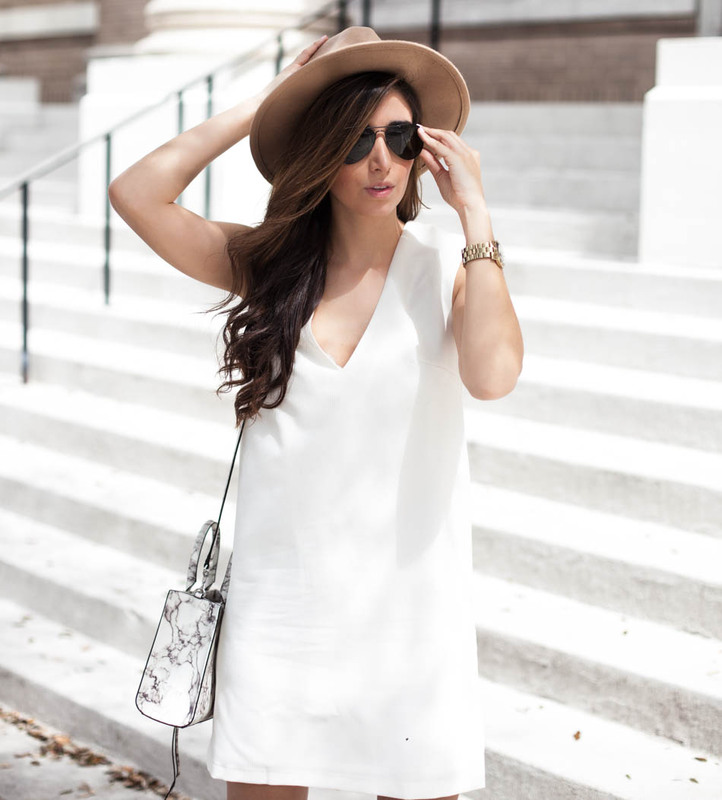 An classic white dress never goes out of style. I love the shape of this dress and how you’ve accessorized it. 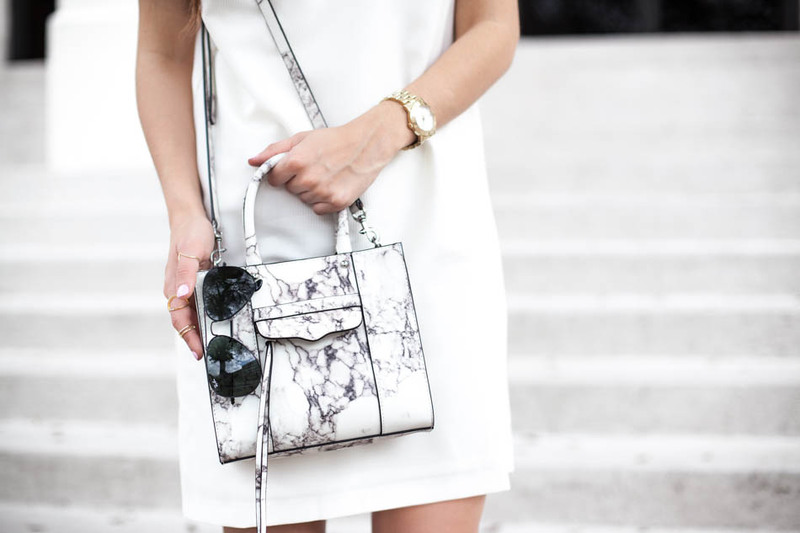 The marbleized purse is an excellent addition, too! So perfect! Love your pretty dress! It is so great with that printed bag and those wedges! Such a gorgeous look and wishing it was that warm here today! I am personally not a fan of shoes that make me taller than I am (5’8″) as I feel like a giant as it is (LOL) BUT your shoes look really comfy to me for some reason! 🙂 Love the purse too! OBSESSED with that amazing bag!! You styled it perfectly with the white dress-so chic!